China is weaker than it appears and no real threat to us - yet. In these times of economic stagnation and international failure, it's very American to look at other countries and see a potential world ruler. 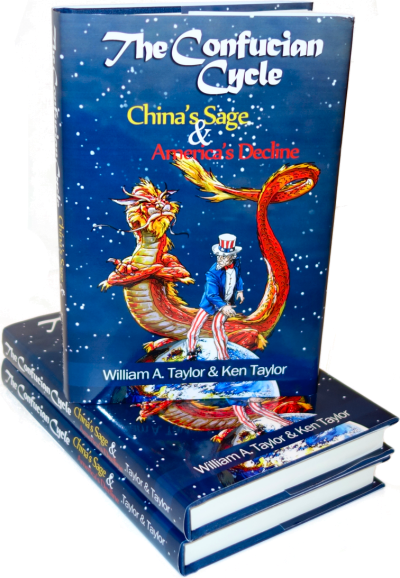 Our older readers will remember when the Soviet Union was viewed as a serious challenger to the United States; the middle-aged will recall magazine covers proclaiming Japan as being our future economic master. We now know that the USSR had an economy a fraction of ours; they only appeared powerful because, like North Korea today, they put all their resources into the military while letting everyone else starve and everything else decay, particularly the environment. But that only works for a short time. You can't expect much world-beating innovation from a country where most people are barely staying alive. Japan never had that problem; its technological and business success was entirely real and the people of Japan live comfortable first-world lives. But there aren't that many of them, and the spread of Japanese-style quality manufacturing systems across the world after their rise to prominence in the 1980s seems to have stolen their thunder. The nation of Japan has now suffered from nearly twenty years of stagnation while their big companies desperately try to stay afloat by moving production to other, cheaper countries just as ours have done; nobody now thinks Japan will ever be a global economic hegemon. Today's understudy for the role is China, which on the surface seems plausible. Unlike Japan, China is enormous in territory and unlike the USSR, equally enormous in population; the Beijing Olympics showed that at least some of China's vaunted prowess and progress is genuine. A recent article in the Daily Mail, though, sheds light on a reality that most ordinary Americans will never see but which the Chinese people themselves are all too well aware of. Apple in China has posted instructions on how to tell an official power adapter from a fake one, after a number of iPhone owners claim to have been electrocuted by their handsets. The page shows images of chargers for each Apple device, including the iPhone 5 and the iPad 2, with the safety notices underneath. The recent electrocutions took place in the Chinese cities of Beijing and Xinjian, putting one man into a coma and killing another woman. Here in America, we are used to jokes about the cheap Chinese crap that fills our stores, generally followed by a plaintive story about "good old American quality" back when we had factories employing Americans to make stuff. When was the last time an American got fried by a cheap Chinese power adapter, though? Rarely if ever. We do recall the great pet food scandal of 2007 which offed a few household animals due to a contaminated batch of ingredients supplied by China. How does that compare to a country in which poisonous baby formula is so common that neighboring Hong Kong, where standards are higher, has restricted its export for fears of a local shortage? As conservatives, we often rail against government regulations and trial lawyers. Yes, America is the poster child for an excessively litigious society and is fast becoming the poster child for red tape entanglements that destroy small business, but there are worse fates: a land in which there is no effective legal redress, and where government regulators can easily be bribed to overlook even the most outrageous behavior. A former department head at China's drug regulation agency was sentenced to death Friday on charges of accepting bribes and neglecting official duties. Cao Wenzhuang, a department director at the State Food and Drug Administration, was given the death sentence with a two-year reprieve, said his lawyer, Gao Zicheng. Although the sentence was unusually harsh given the charges, such suspended death sentences in China are usually commuted to life in prison if the convict is deemed to have reformed. Notice what happened here. The deaths weren't caused by a mistake or by someone not following the directions. They were the result of the manufacturer knowingly making medicines that weren't what they claimed they were, and by a regulator knowingly approving them in exchange for a bribe. The death penalty seems appropriate for this kind of thing. Now, we've got plenty of incompetent regulators here who don't catch problems that they should and we even have the occasional company that cuts corners a bit too fine. The last time we can recall an American company knowingly selling products that would kill people who had no idea there was a risk, was with the Ford Pinto in the 1970s. It simply doesn't happen anymore here. Why not? Conservatives understand that government regulations have the ability to destroy economies and that corrupt officials lead to deaths. However, the basic principle of independent, authoritative inspections is a good one, whether it be performed by a government authority or by something like the Underwriter's Laboratories whose trustworthiness has been proved over many years. China doesn't have anything of the sort, precisely because its regulators and auditors can be bribed. A certificate of purity is only as good as the reputation of whoever issued the certificate. The certificate of purity from China's equivalent of the FDA turned out to be worthless for the antibiotics and the cat food. The certificate of safety from China's equivalent of UL wasn't much protection to the poor people electrocuted when they tried to plug in their iPod. Big-government types will say that China needs to do a better job of rooting out corrupt officials; Confucius would agree, and would applaud the death sentence meted out. Certainly we agree that corruption should be punished, but what China needs is more independent entities apart from the government: a truly independent UL equivalent, and a truly free press that seeks out corruption and fraud and proclaims it to the skies. The Internet, even in China behind its Great Firewall, is already starting to serve some of this purpose as individual Chinese surveil the behavior of their rulers and publicize their malfeasance. That's a start, but both civil society and commercial honesty have a long way to go. Yes, China seems like it's advancing by leaps and bounds, and there's no doubt it's come a long way. Until the Chinese can plug in an iPod or feed their baby without worrying about electrocution or poisoning, though, it will be no existential threat to America or its economy. Now, China with Japan's passion for morality-driven quality... that's another matter. Oh no, a new bogeyman! Observations: The two Asian nations with the best quality control were both influenced by the US, Japan and Korea. Both are economic dynamos and are first world countries economically speaking. Petrarch points out how we demean Chinese products. We at one time had the same attitude towards Japan and Korean products. While we were laughing they ate our lunch. Will we make the same mistake with China? No one knows but the thing that will hold China back is their disrespect for property rights and laws. Sentencing someone to death is severe no doubt but it probably means he didn't know who to buy off. So how do we regain the number one position in the world? Free market capitalism and low tax rates. With our technology, with our respect for property rights, and with our current economic engine there should be no one to challenge us but we ourselves. Only through miserable economic policies like obama endorses can we cede our position. It is not that we work harder, are smarter, or anything else. It is that we have had in the past an incentive to create wealth which in turn makes more people wealthier than the rest of the world. We must curtail the advancements that unions have crippled businesses with, with OSHA's onerous regulations and interpretations of those regulations, and the disincentive to create more wealth for the entrepreneurial folks that walk among us. Other countries could do the same thing if they would emulate our Constitution but they won't do it. I can't blame them a lot when one of our Supreme Court Justices says they should not copy the Constitution as it is outdated and flawed. What kind of a country have we today and what we will have tomorrow has to be two different things. Is there an echo in here? Tax the Fed, Bassboat, and we won't even need the IRS anymore.